I showed several solutions to computing factorial using asynchronous methods in Factorial using promises. Two of the solutions used native ES6 promises and generators. I wanted to find out which one is faster. Chrome v8 natively supports both features. I started with a simple page and performance profile calls. Open this page in Chrome (I have v40) and be surprised by the huge difference in performance. The solution using promises takes 1 second. The solution using generator function takes 7 milliseconds. I was so surprised by this difference that I wanted another confirmation. I posted the same code to jsperf website and ran the tests on Chrome, Chrome Canary and Firefox. The results confirmed that using a single generator function is much much faster than creating a long chain of promises and executing a large number of .then callbacks. 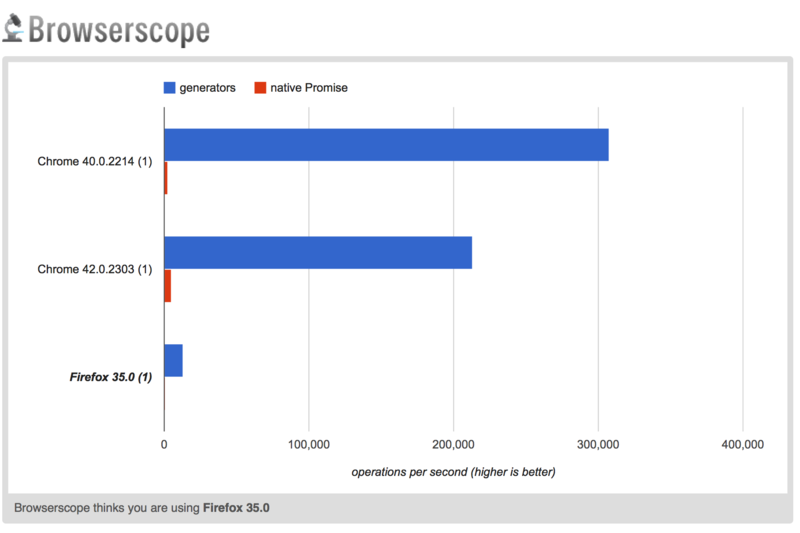 Promises are powerful, but there is a performance penalty to using them. There are ways to use generators AND promises together to minimize the penalty, see Going Async With ES6 Generators by Kyle Simpson.